I don’t know why it’s taken me so long to write about York, as it’s somewhere I go a lot. With train tickets from Newcastle priced fairly reasonably even at the last minute, York is one of my favourite day trips. Trains run regularly, at least every half an hour, and if you get one of the fast ones that’s destined for Kings Cross you can be in York within an hour. It’s a city that has a lot of history, a lot of charm, and a lot of visitors, so if you’re planning on visiting be prepared for crowds and a bustling city centre. The medieval history remains in the form of narrow, cobbled streets, including of course the Shambles, often voted one of the prettiest streets in Britain. Whenever I visit, I end up doing a mix of the same three things, shopping, food and alcohol, but there’s a lot more to enjoy. Whether you’re visiting for a day trip, or a bit longer, here’s just some suggestions of what you can get up to. The photos in this post were all taken by myself, across many visits, weathers and seasons. 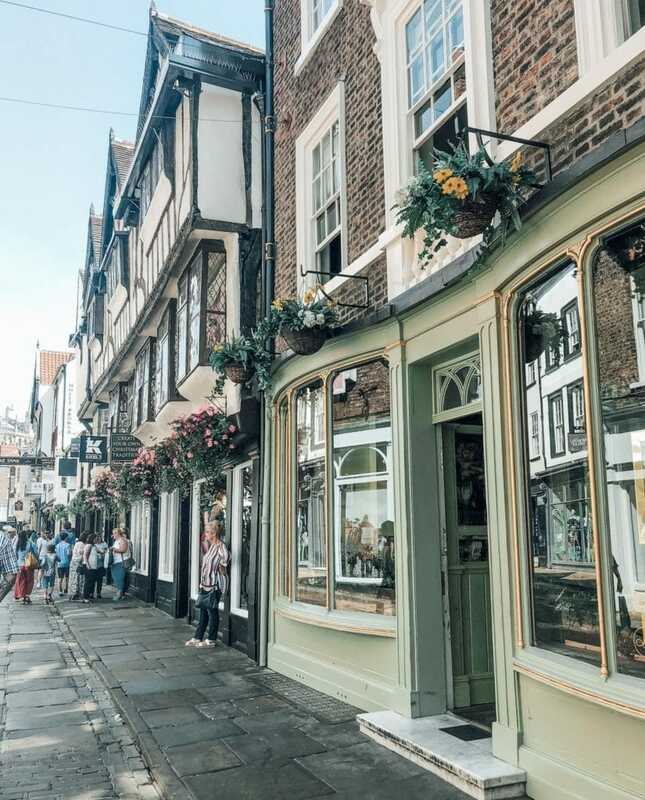 One of the first things that springs to mind when in York, is the famous Shambles, a medieval street that still has so much of its ancient character and half timbered buildings. A lot of the shop fronts have been upgraded from what they were originally, but you can see how they will have looked in the past when goods were sold through windows on shelves, upper floors leaned in almost touching each other to cast shade over the butchers meat below, and doorways were tiny. 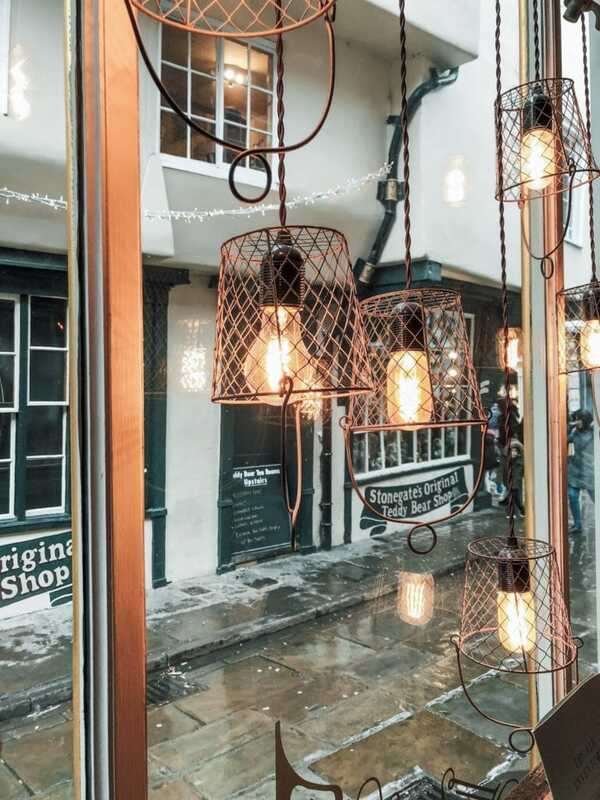 Dating back to the 14th century, the Shambles is now home to a new run of shops. These include a fabulous pie shop, souvenir shops, chocolatiers, and of course Harry Potter themed stores. The street itself is said to have been the inspiration for Diagon Alley in the Harry Potter novels. There are two Betty’s locations in York, and the Yorkshire tearoom chain is the most popular traditional English cafe for afternoon tea, cakes and pastries. The main location is found on the corner of St Helen’s Square, and you can’t miss it largely due to the constant queue outside. You can’t book for traditional afternoon tea in the normal tearoom, but you can book for the Belmont Room afternoon tea which is slightly more formal upstairs. I’ve done it once and it’s £34.95, or £42.95 served with champagne. It’s lovely for an occasion, and the Betty’s own breakfast tea is worth the price. Book direct on the Betty’s site here. I’d also recommend it for breakfast or brunch, as they serve a cracking full english fry up. There’s a smaller location on Stonegate, which has a gorgeous little shop front, always displaying the latest seasonal treats. There’s a very well stocked gin bar on Stonegate, which stocks a huge range of gins from around the world. It’s worth visiting in itself, but out the back is one of my favourite bars in York, Evil Eye. It markets itself as the home of the quirky, weird and wonderful, and it is just that. There’s various floors, all brightly decorated with strange decor, but basically it’s a busy cocktail bar, that also has a great outdoor space out the back. In the evening it’s lively, but during the day it’s a perfect sun trap with views of York Minster. Perfect for an afternoon of gin. Right in the heart of the city St Helen’s Square is always filled with people, street performers and sellers. There’s always something going on, and at Christmas this is where you’ll find the giant city Christmas tree. The main Betty’s can be found here as mentioned above, and so can the relatively new Ivy restaurant. It’s a good meeting spot and place to start your exploring of the city as it’s so central. 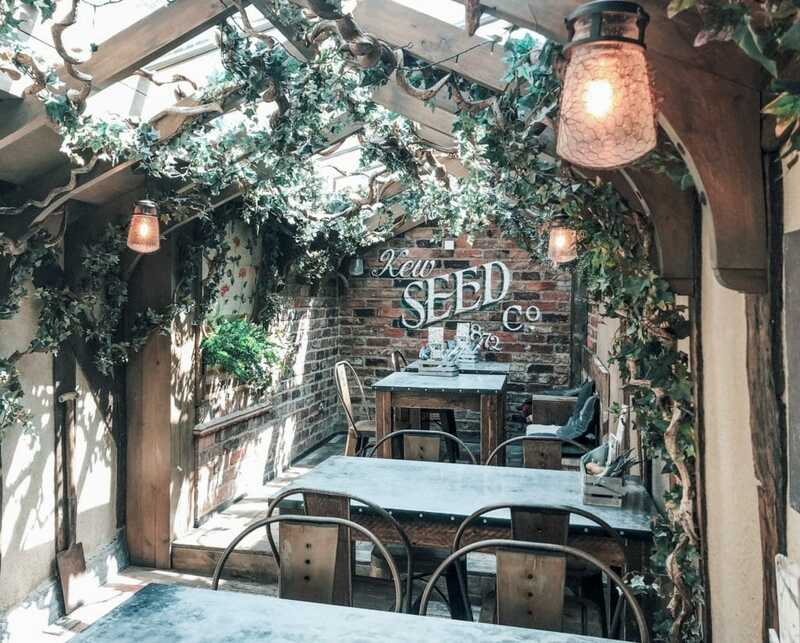 The Ivy is making it’s mark in many UK cities outside of London now, and York has it’s own too. I went for the first time in March of this year for my sisters birthday, where we had the brunch menu. There’s plenty to choose from on the menu, food was excellent quality and so were the cocktails. One of the main things about the Ivy is the service, which is impeccable, but also the atmosphere. Being in a traditionally old English city it’s very different to the only other experience I’ve had of the Ivy, which was in LA. It’s tailored to the market and it was a really nice way to celebrate their birthdays. I would strongly recommend the signature Ivy cocktail. Again, it’s popular so booking ahead is necessary. I think this street is often mistaken for the Shambles, as it has a similar medieval feel to it. It’s lined with proper British pubs, little boutique shops, and more recognisable names in a more quaint setting than they can usually be found on local high streets. Bars such as Evil Eye, The Botanist, and the House of the Trembling Madness can be found here, and The Botanist actually does a lovely Sunday dinner. Like most buildings in York there’s lots of little rooms, tiny staircases leading to more areas, and a high stool seating area downstairs which is great for people watching out the window. Another great food spot is the York Roast Co, which has pulled pork sandwiches on offer all day from the daily hog roast, served with apple sauce. It always smells unreal as you walk past. You can also find Cath Kidston, Sweaty Betty, Jo Malone and the most amazing Oliver Bonas shop I’ve ever been in. I love that store anyway but the one in York is done out like a house. Betty’s little tea room is opposite, and you simply have to nip in for a box of their English breakfast tea and a cake even if you haven’t got time to sit in at either of their locations. 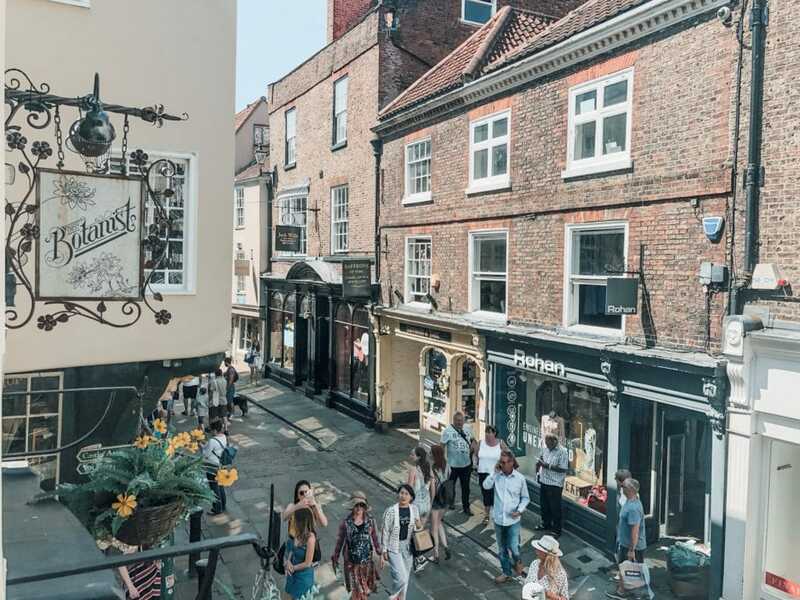 There are many little old alleyways and further streets that lead off from Stonegate, and these are also little treasure troves of their own with plenty surprises, places to eat and shops. Bars and restaurants include recognisable chains like Turtle Bay, Las Iguanas, Gusto, Banyan and Cote Brasserie. There’s also a really good tapas place that my cousin who lives in York took us to last year, called Mr P’s Curious Tavern. It’s a bit different and the food was so good I’d really recommend it if you don’t want something you can get anywhere. The Mulberry shop on the corner is one of my favourite shops in York, and it’s right next to the little Coffee Yard alley that leads through to Stonegate. The shop itself is quite big, and often has good discounted prices on the latest bags and leather items – great if you want to treat yourself. The huge gothic cathedral is right in the city centre, and this actually really annoys me but you do have to pay to go in. It’s £11 for an adult ticket, or £16 if you want access to the tower. It is impressive, as are the stained glass windows but I just don’t think it’s right to charge entry. I’m sure they need to rather than relying on donations, but still it puts me off. You can climb the tower for views over the city, get guided tours, and visit the museum that delves back through the 2000 year history. The historic walls that surround the city centre open daily from 8am, and close at varying times depending on the time of year. There are various access points up onto the walls, which give beautiful views of the city and the cathedral. With the majority of William the Conqueror’s original castle ending up in it’s own moat, Clifford’s Tower is what’s left, and like the City Walls and Minster tower it offers sweeping views of the city. Located on Tower Street there’s also a big car park nearby and is a good central place to park. Another square found near the Shambles, King’s Square is popular for the Duke of York pub and restaurant, and also the Chocolate Story, which is a museum and chocolatiers that sells incredible chocolate dipped strawberries. In the summer you can get fresh lemonade squeezed from a street vendor, and in the winter there are roast chestnut sellers. Close by is the Shambles street food market, which is open 7 days a week. Like most cities there are a number of river cruise options available with different themes, as you sail along the river sightseeing tour. For more info take a look at City Cruises York. The Viking Centre, York Dungeon and the Railway Museum are all popular museums for families and tourists. York Armoury can be found on Stonegate, and of course the Harry Potter shops are always a magnet for kids and adults alike. For many years my cousins, friends and other family have enjoyed our Christmas Day of fun (read – drinking day) in York, as it’s one of the most Christmassy cities and perfect to get you in the festive spirit. The market located in the central square is one of the best in the UK, the giant Christmas tree is found on St Helen’s Square, and the year round Christmas shop on Stonegate spills out onto the street with people wanting their customised decorations and gifts. A favourite pub for festive drinking has to be Lendal Cellars, which is always so cosy under the underground archways and outside courtyard. There are two things I want to mention that aren’t within the city centre, the first being York Racecourse. I’ve been here once and it was a great day out, a lot more civilised than some of the race days at Newcastle Racecourse (looking at you Ladies Day), and it was fun to go somewhere different that was doable in a day. Also McArthur Glen designer outlet is just outside of York, and there’s plenty designer bargains to be had if you can be bothered to look around. I hope this has provided some inspiration for how to spend your time in York, it really is a great city to visit and I can see why people come from far and wide to see it. There are city pass options available for tourists but I’m really not a fan of those. The best way to explore York is undoubtedly on foot. A bus tour can’t take you down all those narrow alleys, or among the pedestrianised squares that make York so lovely. 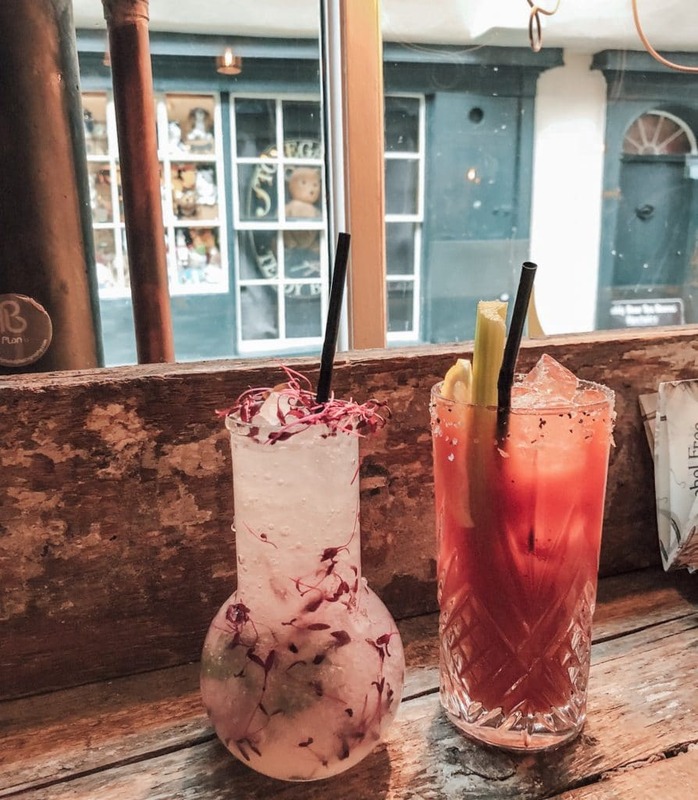 The old medieval character is still very much present everywhere, and there are an abundance of good places to eat and drink that are just a bit different to the norm. I’ve only mentioned a handful of them so let me know of any good finds you discover so I can add them to my list. Selfridges Rocks their Christmas Window! 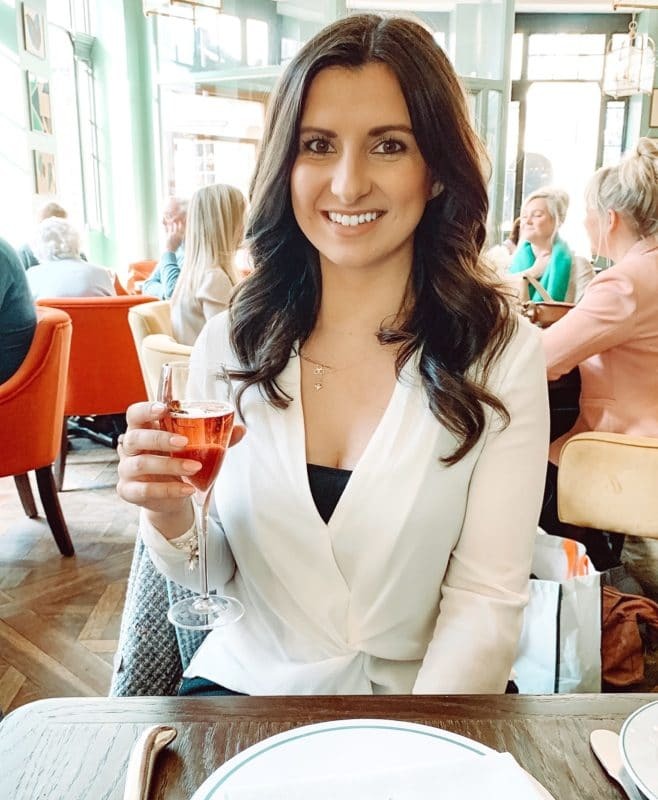 I haven’t been for so so long (I think the last time as a couple of years ago when my friends treated me to a little hen day trip just before my wedding) – you’ve definitely inspired me to return! I don’t know why on earth we don’t have a plan in the diary! I love York! I only spent a couple of nights here but did hit a few places you mentioned. I would highly recommend the York Minster for Evensong. So beautiful! Would love to make it to York someday, not to mention a tonne of other places in England. As a former medieval history and archaeology graduate, I would love it there – more for the architecture and history than the shopping. I’m fascinated at how tearooms have become so popular (and pricey)! I’m originally from Ireland and I believe they’ve taken off back home too. I’d have a wander around and pop into a cosy pub for an afternoon pint, or two. A sandwich at the York Roast Co. would be a must – even on our budget! You’ve put together a really comprehensive guide to this beautiful city. I love York! It’s been years since I’ve been and am actually planning on going there this summer. So, this post is helpful and a good reminder of why I loved it so much.